This arm support attaches to dental and surgical saddle stools to support the body and arm for precision work. Also known as a dental assistant's arm, body support arm, belly bar, or surgeon's arm. The arm is compatible with the Bambach Saddle Seat, Salli Saddle Chair, Brewer 135DSS and others. Recommended for surgeons, dental assistants, and sonographers. Includes arm only. Saddle stools available separately. 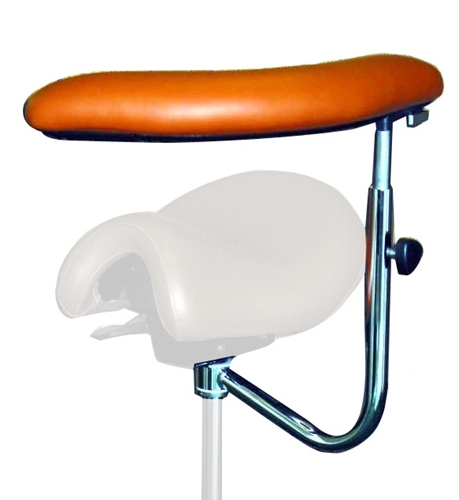 Please contact us for questions about compatibility with your saddle stool. Arm support can be mounted either left-handed or right-handed. The Body Support Arm accessory attaches to the gas cylinder of the chair, enabling its use with most medical and dental stools with with pneumatic seat height adjustment. Upholstered with surgical vinyl in a variety of colors. Your chair must be disassembled and the pneumatic cylinder removed for installation of the support arm. Precise positioning and secure attachment of the bracket collar to the pneumatic cylinder is critical. We recommend that the installation be performed by a trained chair service technician. This item is made-to-order. Please allow 7-14 business days production time before factory-direct shipping. May ship either from Novato, CA or from Wisconsin. Items shipped from Novato are available for free local pickup. This item is custom made-to-order and is not returnable.